The O2 Pro Skill features the deepest arch cut we make, giving you a wide range of motion while keeping a long cut giving you the extra protection needed. Air Maxx TPU cushioning that is used in our best performing helmets is featured in our new Air Maxx Flex 2.0 Shoulder Pad Series. TPU cushioning is positioned over the shoulders providing enhanced impact absorption. Air Maxx TPU is durable and will not break down – even after thousands of impacts. Energy Lock Technology powered by D3O is a lightweight, soft, and flexible material featuring unique molecular properties. In standard conditions its molecules flow freely, but on impact, they lock together to absorb impact energy and reduce the force transmitted. The material is rate sensitive, so the harder the impact, the greater the resistance to the force. Our D3O® foam is strategically positioned over the shoulder for optimal impact absorption. System absorbs impact specifically around the AC joint and provides maximum shoulder protection. The hook and loop pad attachments can be re-positioned or removed to ensure a precise fit and complete coverage in the key hitting areas. - High performance arch designs minimize weight without sacrificing hitting zone protection. These new arches are engineered for maximum range of motion and mobility. - Streamlined and balanced arch designs keep arches and cushions in proper hitting position with less “upward” movement of shoulder pads. - Newly designed, positioned and sized epaulets and caps (low profile) eliminate“grab” points and create better overall performance. 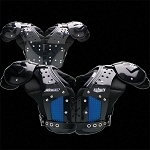 - Position specific arches include QB/WR, Skill for RB/DB, All Purpose for FB/LB/TE and OL/DL with Non-Epaulet design. - Raised corrugations for additional strength and increased air flow. - The body cushion has 02 windows which are large openings that maximize air circulation, allowing excess heat to escape and sweat to evaporate. The windows are positioned in the front and back arch portions. - Ventilated arches with raised corrugation and 7 mm vent holes combine with perforated high Impact EVA foam throughout the body cushion also encourage heat and sweat movement. BIOTHANE belts create a snug and secure fit while securing the shape of the arch to maximize range of motion. Removable deltoid and scapular pads for customized fit. The high impact EVA foam is sewn into channel allowing improved air flow. 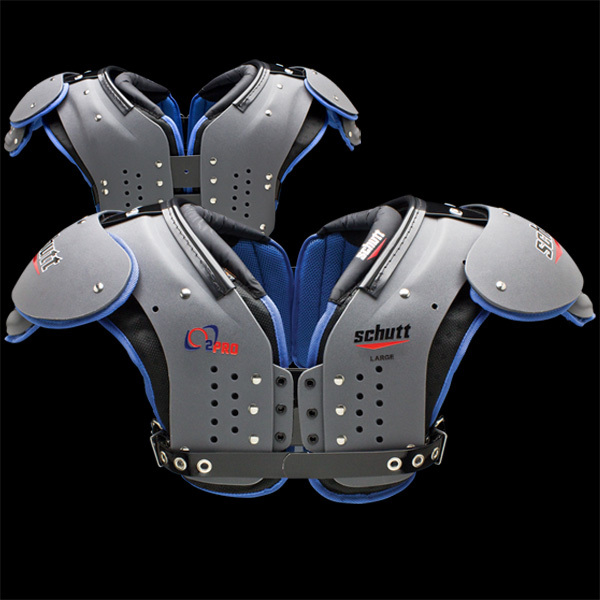 One of the lightest varsity shoulder pads on the field. The Schutt O2 Pro Skill is great for all skill positions. This pad does not limit the player to any position and offers great protection for every skill position.